The first iterations of Diana’s elegant wedding bands were made in 1925 as a limited edition Krementz & Company collection. They quickly grew more and more popular among the jewelry industry’s high end clientele, due to their fine quality and 18k gold build. By popular demand, Diana wedding bands made their way to jewelry ateliers across the country, bringing the notion of handcrafted perfection and elegant sophistication to couples everywhere. Today, Diana stands as a tribute to classic design -- showing that bridal jewelry doesn’t always need to be trendy or extravagant to be beautiful. Diana offers refined wedding bands for both men and women, using time-honored jewelry-making traditions to craft their sleek pieces. Many of the pieces in the men’s collection feature white gold, yellow gold, or rose gold as the main color and another color as an accent. Additionally, the brand also offers designs wrought in palladium and platinum, a dependable choice for men who work with their hands often. No matter your fashion sensibilities, you’re sure to find a style that appeals to you at Long Jeweler’s Virginia Beach showroom. White gold wedding rings with rose gold milgrain details contrast with simple hand-hammered palladium bands. For the groom-to-be looking for pieces with more intricate details, look to wedding bands with colorless or black diamonds set into their faces. Whether they’re used as accents or the main feature of the design, they add a sense of glamour and lavishness while still staying true to Diana’s sense of timeless beauty. 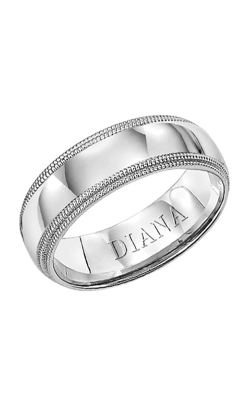 Why Shop for Diana Wedding Bands at Long Jewelers? As the premier fine jeweler in Virginia Beach, Long Jewelers has served local communities like Norfolk, Chesapeake, and the Greater Hampton Roads area with high quality engagement rings, wedding bands, Swiss timepieces, and fashion jewelry pieces from brands like Hearts on Fire, Tacori, and Raymond Weil. Under the leadership of David Long, the founder of the jewelry retailer, Long Jewelers has seen much success in over 30 years of business. In addition to being a member of the Museum of Named Diamonds, the showroom has been featured in magazines like Town & Country and voted the “Best of the Beach” more than 20 times in a row. Because of these accomplishments and more, it’s easy to see why Long Jewelers is the community’s trusted source for all things fine jewelry. For more information on the products and services available at Long Jewelers, contact us on our website or call (757)-498-1186 today!